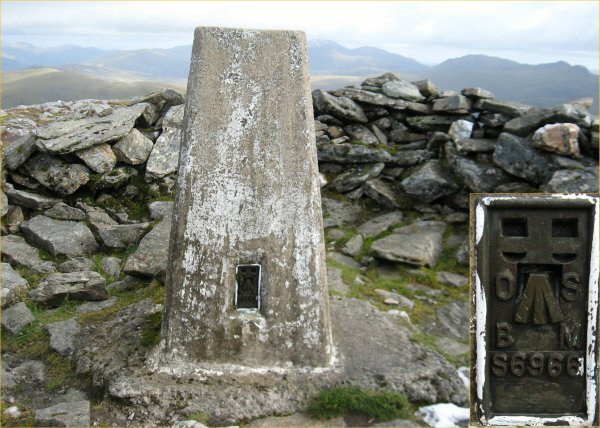 Is ranked joint 916th with 37 other trigs (more). Straightforward out & back from Glen Lochay. Cracking view down to Loch Lyon. Hard to fault this on such a fine day with excellent visibility. Sat on top for a good half hour admiring the view. 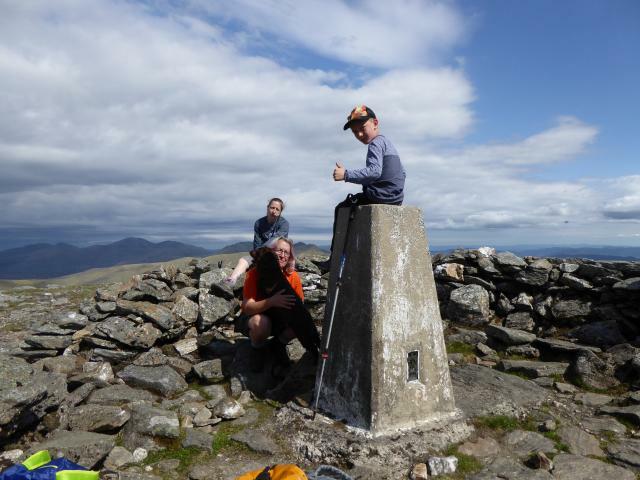 Ascended via Beinn nan Oighreag and Cam Chreag and descended via main path to south east. vgc, no cap or plug. 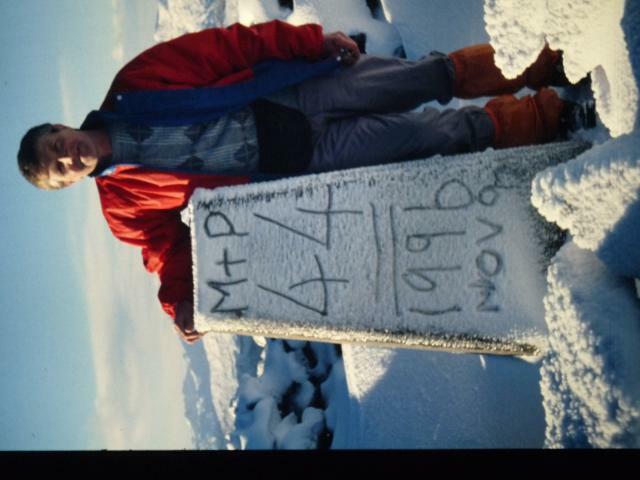 Met Dave Hewitt at the Kenknock car park (477368), left a car there then made the standard ascent from Duncroisk (527363). Some old icy snow (covered with fresh from yesterday) so we donned crampons and made good use of it. Unlike everyone else today, we head west over the two CTs, then make a minor detour to the Graham Top before descending via Lairig Liaran. Nice rocky stream leads back to the car. Then home after a nice 3 day wintry weekend. Just right to fill in the afternoon after a 5 hour drive up to Scotland from Yorkshire. Good path up west side of Allt Dhuin Croisg to south, then delightful ascent on moorland trod/path from Old Shielings. 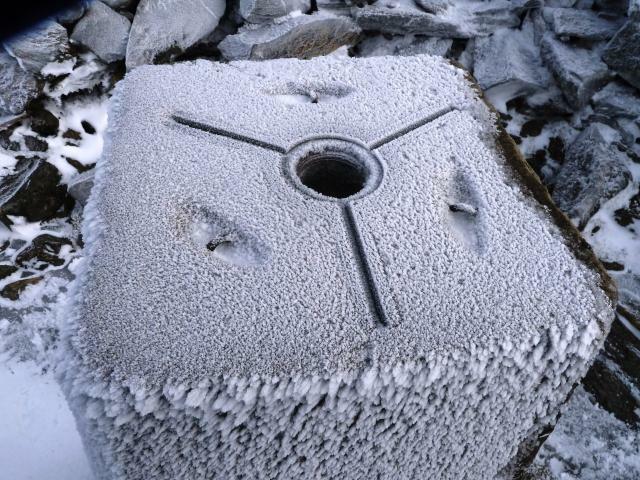 Inside shelter cairn, spider open ( evidence of asphalt plug having been removed ).Previously visited this pleasantly symetrical Munro 04/05/69 , 13/04/88 & 26/09/09 . This visit to come over Cam Chreag which could be confirmed as a new Corbett top. 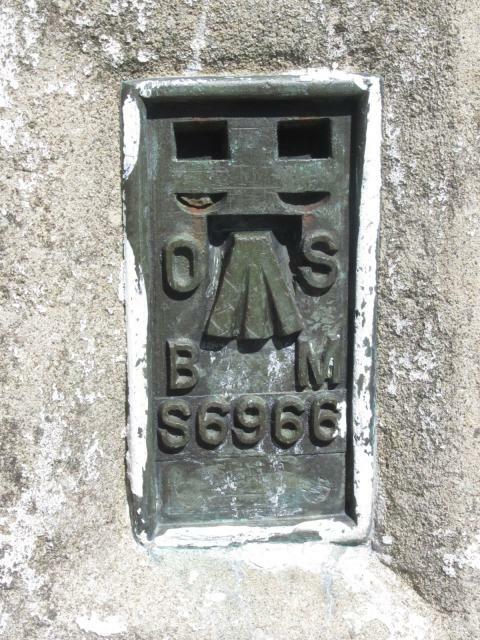 HISTORY: This pillar was completed on 22nd June 1952 costing �81.6s.4d. 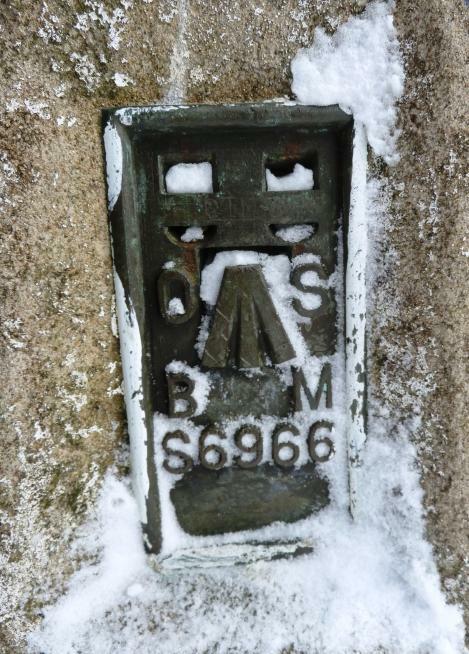 In 1952 this marker was computed for triangulation as secondary station NN61/11 in the Callander block. The flush bracket was levelled for height to Class 2 precision also in 1952. 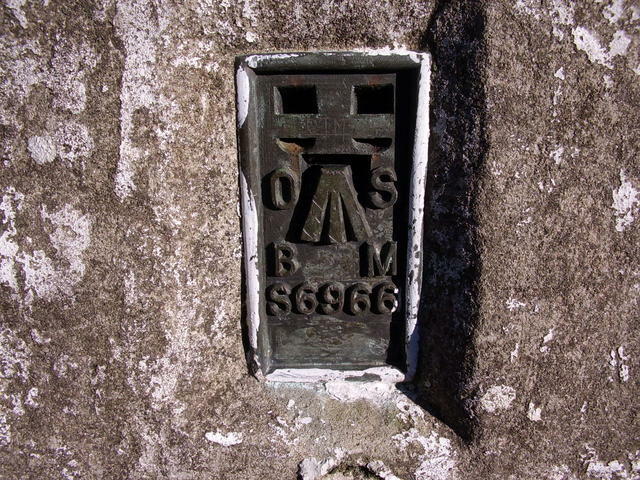 This trig point was last maintained by the OS in June 1980. SITE VISIT: Parked by roadside at NN526364. Ascended via signposted well trodden route through adjacent field. Up via SE slope. Pillar in wind shelter and in good condition. Tar plug broken open. Flush bracket faces WSW, compass measurement 257�. All four sight holes plugged. 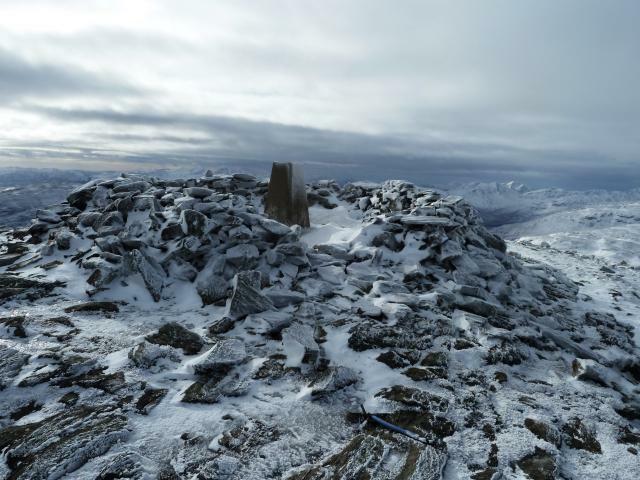 360� panorama from top includes Ben Vorlich & Ben More. 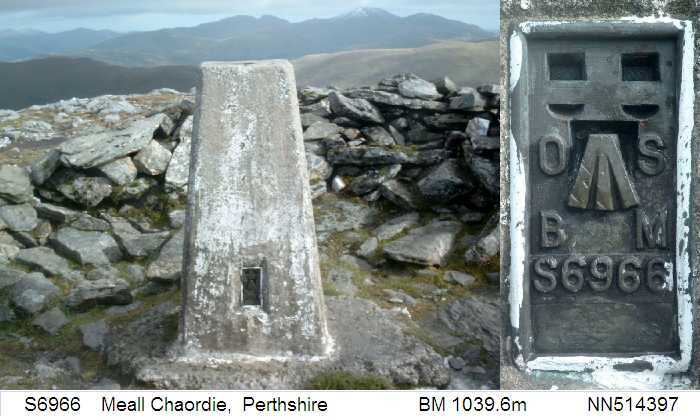 S6966 - Meall Chaordie pillar & FB. S6966 - Meall Chaordie & GRP. 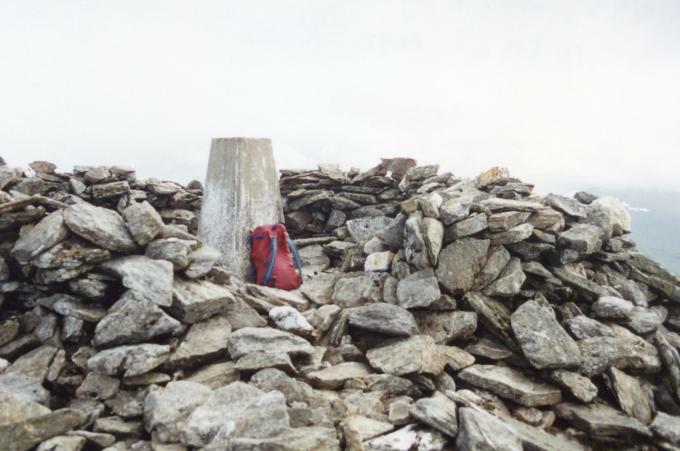 First new Munro of 2008. Unfortunately no views as the cloud was down to about 700m. Trig surrounded by an excellent and roomy circular shelter cairn (the best I've seen! )which actually gave excellent protection from the chilly wind while at the summit. I ascended this hill from Glen Lochay. 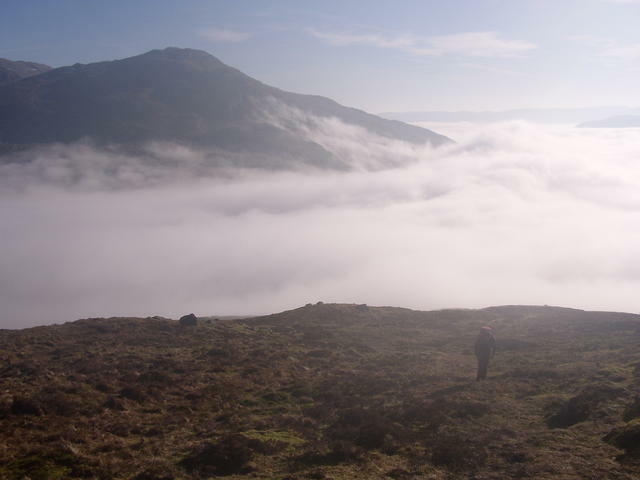 came up the south side, because of the sun and inversion conditions, i like drumlin's idea but not today eh! Advise visitors not to take conventional path up, as it's horribly tedious and boggy. I took it down but ascended from further up the glen: entertaining route through head-high bracken. Sadly the cloudy nature (no hope of a view) and the prospect of the Killin Highland games has led me to a southern baggers route. However ignore the direct route and is is possible to make it a little more interesting by following some of the burns towards the summit then making a bee line. 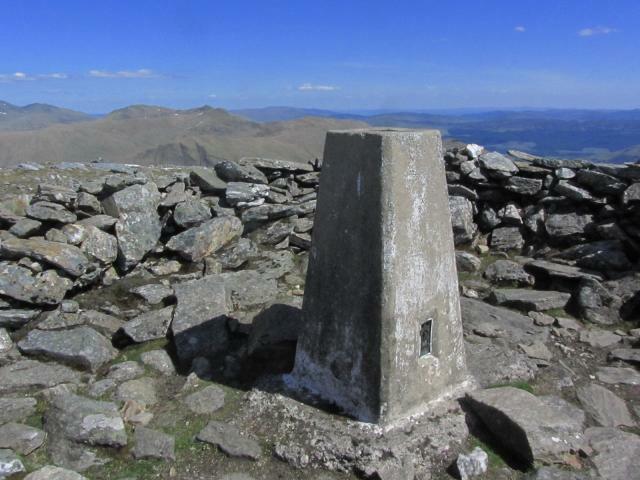 Munro no.64. Approached from the south, the easiest but not necessarily best route up. 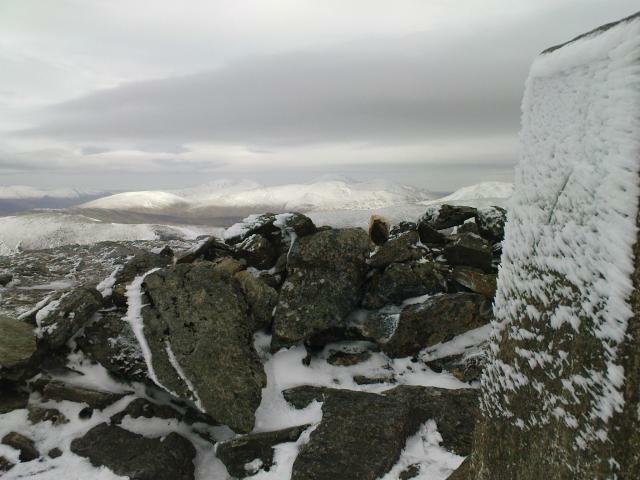 A jumble of stones on summit with trig in centre. Views were good on a clear day. 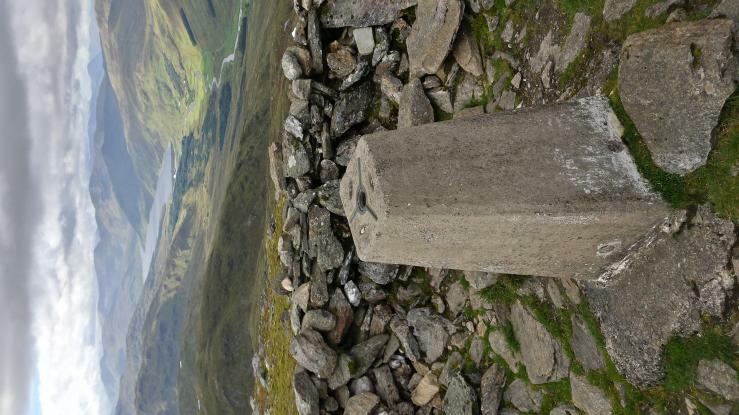 Ascended by the usual Munro route from Duncroisk. 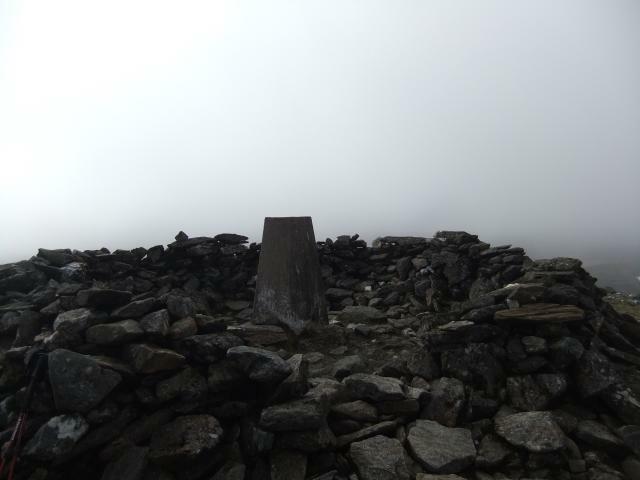 After having fine views of the mountain from various directions over the previous days on the day I chose to climb it there was heavy rain, mist and nothing to see at the summit. A rapid ascent and decent from the road through the mud, I ran down the hill I was so keen to get to the pub fireside! 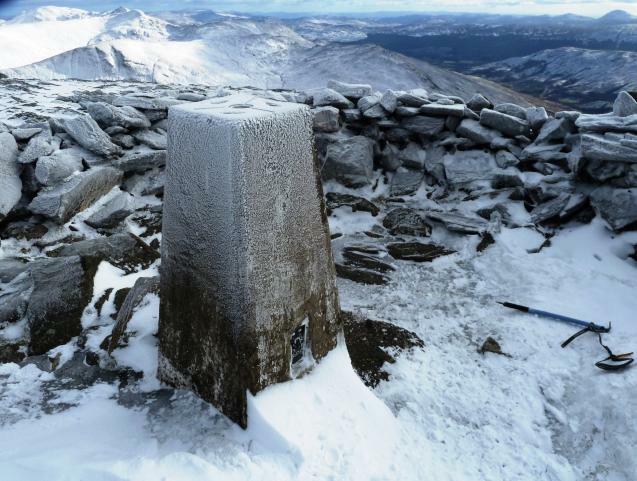 The unremarkable thing about Meal Ghaordaidh is the awful route than nearly everyone takes to get up it. horribly abused by Munrobaggers this hill is very enjoyable combined with some of its neighbours or from the north. Second visit on a glorious winter's day. Saw no one until the top which was mobbed. I've climbed this hill twice and have no photos of the trigpoint. 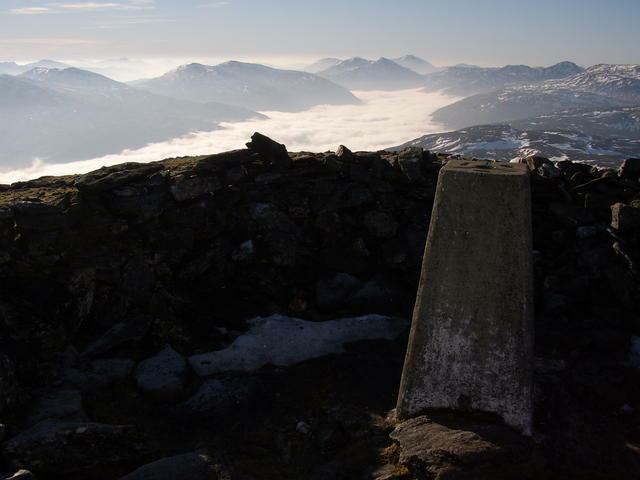 The 2nd visit was with a temperature inversion and on a very busy day and it was difficult to get near the trig and surrounding cairn. Both days we had good views. Very pleasant easy angled ascent from Duncroisk. 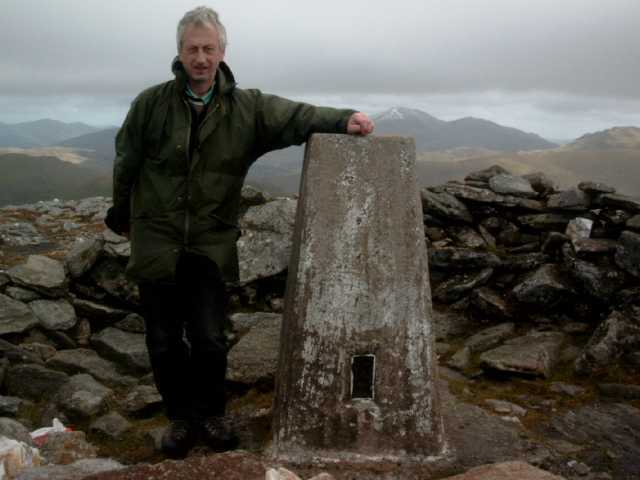 Meall Chaordie (Ghaordie) The trig. A rather unremarkable hill but some fine views. Approached from the south following a well trodden path. heat haze misted over. S Chuil, Tarmachean, S an Lochain, Loch Lyon dam only just visible. Bumble bee! Circular wind shelter. Sloosh in stream on way down.